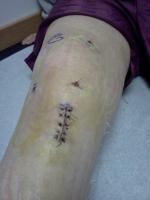 Knock Knees, Patella Femoral Syndrome and Bilateral Release Surgery!! I am a 36 y/o female. I am knock kneed and 4 years ago was told I have patella-femoral syndrome. I have never injured my knees, and I have never been in tremendous pain from my knees, just suffer from occasional discomfort due to persistent grinding and popping. Several times my knee has locked up on me. At that time, I was sent to physical therapy and shown some exercises to do at home to help relieve discomfort by strengthening the muscles around my knees. The most relief I received was when they wrapped my knee (McConnell wrap?). I just returned home from my first visit with a new orthopaedist. He is recommending p/t, steroidal injections (although I don't have any swelling, so I'm not sure if these will help), and possible bi-lateral knee release. How will this surgery help, why would it be bi-lateral (both knees, I presume? ), would the steroid injections help or be a waste of time, how long is the recovery from injections and surgery? I have a 17 month old son, we live in a 2-story home and are considering getting pregnant again soon...would surgery be better if done now or after baby #2? Any information or help you can provide is appreciated.